We have been in the sign business since 1975, and we're professionals at installation. We can meet any needs a customer may have for any install. 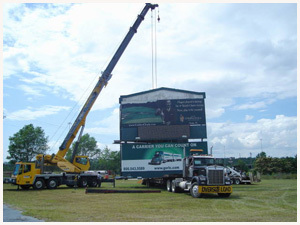 We maintain the newest and most up to date sign erection equipment in the area to get your sign installed on time and in a proficient manner. We install the small engraved wall sign at your local physician’s office that points you in the right direction in addition to the 140-foot pylon sign that points you to the next restaurant on the interstate. Like an ink jet printer for your computer but on a larger scale. Besides being larger, these printers differ from your home ink jet printers in that they have very large refillable cartridges. The ink is also much different. It is weather resistant, resisting the sun’s UV (Ultra Violet) rays. UV rays are what cause the fading you see so often. Printing can be done on adhesive backed vinyl or heavy canvas type material that can be stretched on a variety of surfaces. Any high resolution photo or drawing can be reproduced in large media to convey your message to your customer. Need a lift? We can help. We have trucks in our fleet that reach from 35 feet to 140 feet. Need to dig a hole? We can do that too—augers from 18 inches to 48 inches. All of our crane or auger rentals are conducted by one of our very professional and knowledgeable staff members. Call us with your specifications, and we will be happy to provide you a quote. Every permanent sign is required by respective local governments to both be legal and permitted. We will assume the responsibility for securing permits with these respective inspection departments. We keep all drawings and permits on file for liability purposes. Surveys for national sign companies and vendors are routinely worked into our schedule in a courteous and professional manner. We usually working within 150 mile radius, but under some circumstances, we are able to travel greater distances.